This Varsity football team of 1904 was the first to be known as the Little Giants and the first to be coached by Francis Cayou, pictured second row, far left. This team played and beat Hanover 81-0, Butler 51-0 and Earlham 35-0. They also lost by close scores against much the larger teams of Purdue, Illinois, Notre Dame and Michigan Agricultural College (now Michigan State). It was due to their determination that Coach Cayou told them that they played like “little giants”. Overheard by a newspaper reported and reprinted, this tag stuck and so all of our sports teams have been known since that time. 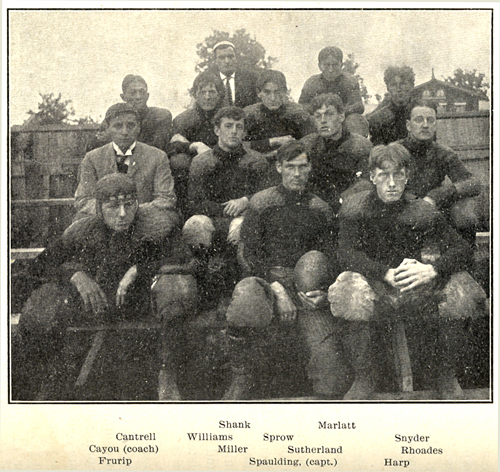 The second African American football player for Wabash is pictured in the top row, far left. Walter M. “Bill” Cantrell started in the position of right tackle and was from Danville, Illinois. The first African American football player was Samuel S. Gordon who belonged to the team of 1903. Both teams faced discrimination and some schools threatened to cancel if either man played. President Kane was firm, these men would be allowed to play or the games would be cancelled. Both men did play with their teams and some games were cancelled. Wabash Always Fights, but that is another post for another day. Lastly, I would also like to highlight William Spaulding, the team captain pictured in the front row holding the ball. Spaulding became a coach at Western Michigan from 1907-1921. He left Michigan for Minnesota from 1922-24. The last 13 years of his coaching career were spent at UCLA from 1925-38. For the next ten years he served as UCLA’s athletic director. This is a small part of a page from the Atlas of 1878. 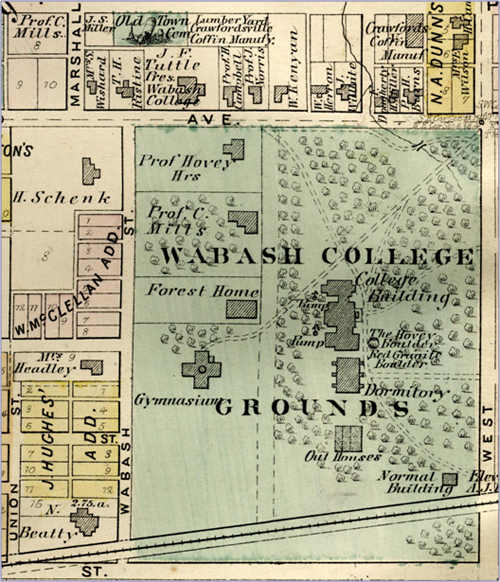 We can learn a lot about the history of the campus from this small image. The “College Building” is Center Hall, with its new library and chapel in the first and second floors of the north wing. The “Dormitory” is what came to be known as South Hall. The “Normal Building” is Kingery Hall and it housed the Teacher Education department or Normal School. 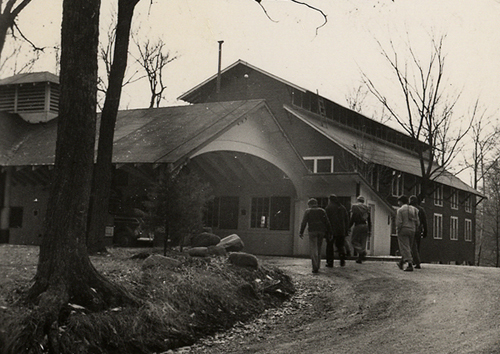 “Forest Home” is of course Forest Hall which Caleb Mills bought and had moved to this campus, about where the Sparks Center is today. The “Gymnasium” was also for a number of years the Hovey Museum then later referred to as Assembly Hall. “The “Headley House” was the home of Atlas Minor Hadley, a professor. This is the home that today we call the Kendall House. Moving again to the north of the campus, we see the “Old Town Cemetery”. Actually mislabeled, this was the Presbyterian Cemetery or the Mills Cemetery as it was owned by Caleb Mills. This was where our founders and the friends of Wabash were buried in the middle of the the 1800’s. Now behind the Phi Psi house, in the years after this Atlas was drawn, the area was developed as residential housing. I read that the graves were very carefully opened and the contents removed to Oak Hill Cemetery. The “Wm Herron” house across from Campus is where Dean of Students Mike Raters lives today. Lastly, the “Crawfordsville Coffin Manuf.” is where the Lew Wallace Motor Inn was located for decades. I hope you enjoy this map as much as I did. As a part of the new curriculum which was instituted in the late 1920’s, seniors were expected to display a “mastery” of the subjects they had studied. Comprehensive Examinations were instituted to measure that mastery. Another new idea instituted at the same time was Study Camp, one of the highlights of the senior year. The days would be spent hiking and studying. In the evenings, several professors, and often the President, would join the seniors for dinner followed by an in-depth discussion. 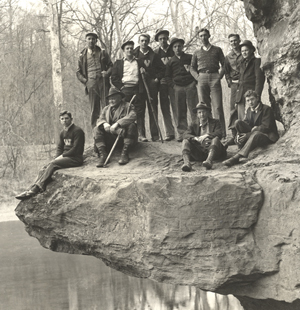 The image above is from Study Camp of 1934. The handsome fellow with the walking stick in the image below is John Gaylord Coulter, the man who innovated Study Camp. This is an image of the Junior Fence from the 1920’s. This fence stood between Center Hall and the Peck Hall of Sciences (where Hays Hall now stands). In this photograph we are looking into what is now the Mall. On the far left behind the fence is Forest Hall, to the right of that is the Tapy house, which were both moved for the construction of the Campus (later named Sparks) Center. At the far right of the picture is the Wabash Power Plant, about where the flagpole on the Mall is today. The junior fence and the senior bench were pretty seriously guarded. Each was passed to the next class during Class Day ceremonies at the end of the year. I like this image because it shows us the Mall before it became the heart of the campus. At the time of this picture, this area was still functioning as the backyard of the College. 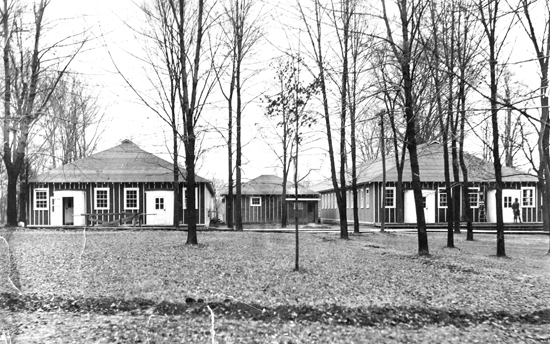 This is a picture of the barracks that housed the Student Army Training Corps of World War I. As America entered the Great War a program was created to avert the “Lost Generation” scenario that had played out in England while also educating the next generation of leaders. All over America there were units of the Student Army Training Corps. 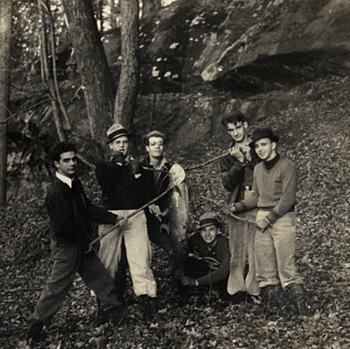 The men of the SATC were enlisted in the army, enrolled in college where their tuition and expenses were paid. In short, they were paid to drill and to study. The barracks pictured here were located about where the Chapel is today and the smaller building between the others was the shower house.